Ojibwe chief Joseph Osawgee was born in Michigan in 1802 and came to Wisconsin Point as a young boy. There he established Superior’s first shipyard—a canoe-making outfit along the Nemadji River near Wisconsin Point. His birch bark canoes supplied transportation for both Ojibwe trappers and French Voyageurs. Chief Osawgee signed the 1854 Treaty of La Pointe on behalf of the Fond du Lac Ojibwe—and subsequently lost his land. He died in Solon Springs, Wisconsin, in 1876. Research can’t pinpoint the exact location of Osawgee Beach, but the site was most likely on Wisconsin Point. 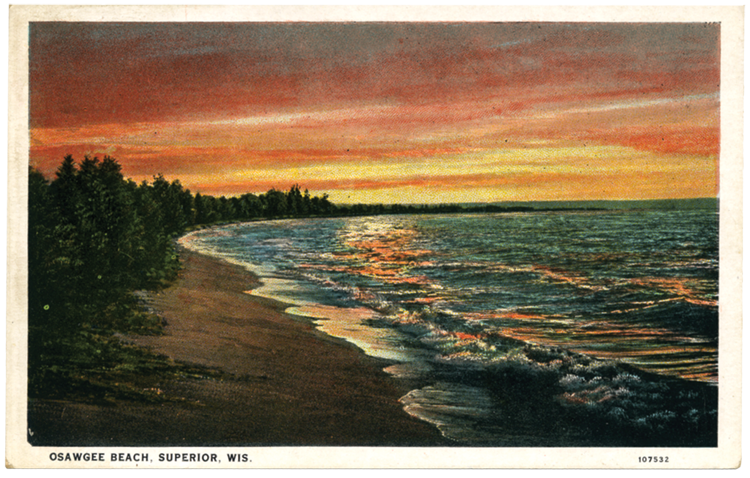 In 1927 the beach was listed as a “forty-acre park at the end of Schafer Drive,” but Superior records show no mention of the street. Today the Osaugie Recreation Trail treks five-and-a-half miles along the Nemadji River to Moccasin Mike Road at the base of Wisconsin Point, onward to the point’s end, and beyond to Barker’s Island.